A two-piece collection for luxurious hydration and radiance. 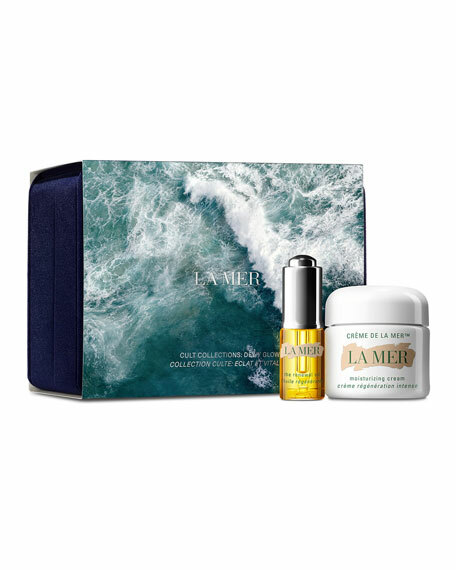 With the hydrating power of the sea, let skin glow with this collection of La Mer cult favorites in a keepsake box. Crème de la Mer immerses skin in soothing moisture, delivering a healthy-looking, glowing finish. The multitasking, dual-phase Renewal Oil floods skin with hydration for allover radiance. Featuring removable inserts, the luxury velvet box is perfect to reuse or display. Follow the La Mer regimen of treatments for optimal results. The Cult Collections: Dewy Glow is applied in the following order: Renewal Oil, Crème de la Mer. For in-store inquiries, use sku #2721809.